Our site is under construction and our business is restructuring. 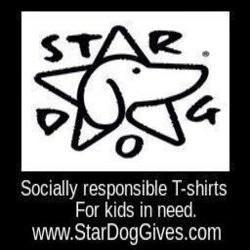 Our super soft Star Dog T-shirts can still be purchased by request by emailing StarDogGives@optonline.net. Hope everyone has a glorious holiday season and we will see you in the new year. Hi - I totally love your cause and would like to support it by buying a shirt. Where can I go to see design/color options and prices?